There is a common misconception we come across when talking to non-homesteaders about our way of life. A picture of open fields, livestock grazing, and large areas for gardening are often mentioned. This seems to be the idealist view of what homesteading is, however, homesteading is far more than this. Homesteading is a way of life, a lifestyle that encompasses self-sufficient, frugal, and independent living regardless of your geographical situation. We do not fit the idealistic view and are taking this opportunity to share the ways in which we find success homesteading in the backwoods. The property we live on is located in Southern Ohio. 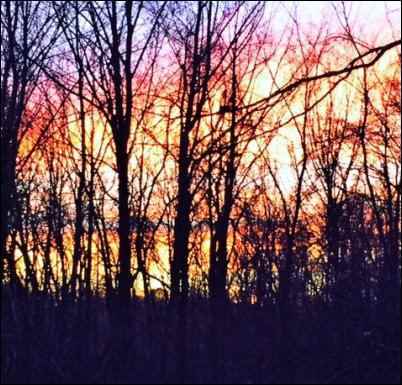 It is surrounded by wooded area and borders Zaleski State Forest. The homesteading life we have chosen consists of subsistence living through hunting, fishing, and foraging the land we have. Resources from our backwoods allow us to make use of the dense, clay-packed soil we have by adding to it for better production of fertile ground to grow vegetable and herbs. We aren’t a picture of the previously mentioned vision of homesteaders, but we are living the lifestyle and utilizing the land to provide a self-sufficient life. The primary natural resources found here are trees, lots and lots of trees! Trees offer many uses that keep our homestead thriving. They offer ideal shading, food, and soil nourishment to create an abundant ecological system of wildlife and indigenous plants. We utilize all these resources in our backwoods to provide for our living needs. We have made use of other components of the trees to build our homestead as well. This includes the leaves, branches, seeds, cones, and even their decaying process to provide for us. We have found many creative ways to utilize our land and what it offers us in building an abundant, successful, cozy life in the backwoods. The largest use of natural resources is in the trees themselves. We utilize them for building, repairing, and as a heat source. We built our cabin from trees harvested out back in combination with lumber supplied by a local Amish company for the shell. The remainder of our home is also sourced primarily from our land. We have used our trees, nearby sandstone, and collected wood that is repurposed to design and decorate our home. The heat source we use is a wood burner, fueled with wood split out back. We find use for the rest of the trees to create less waste of this resource. Smaller branches are primarily used as kindling for fire. We use them for starting our outdoor grill in addition to starting fires in the wood burner. Larger branches can be used for making tools and gadgets around the home. We have used them in a pinch as hammers, brooms, and other tools when supplies on hand have broken. Larger branches and wood remnants can also provide a foundation for making furniture as well. Leaves provide many uses on the homestead both indoors and out. They are collected and stored for our wood burner, offering a building point with kindling to start fires. We also use them in composting with a mixture of table scraps, remnants from wild game we harvest, egg shells, and animal manure. The result is a fertile mixture we can add to the garden for rich soil. Leaves also make an excellent mulch for the flower beds and decorative borders for the cabin. We use leaves as an aide in covering our garden for the winter, combined with straw, and making us able to extend our growing season with cool weather crops. The herb beds are covered in leaves to insulate perennials during winter and it adds nutrients to the existing soil. We also mix them in during re-planting in the spring to keep the soil rich and healthy. This makes for a frugal resource around the homestead. We have a swampy terrain combined with the forest areas surrounding our homestead. This affords us an abundant variety of nuts, greens, fruits, and tubers in the backwoods. We are able to collect and dry a variety of nuts including walnuts, chestnuts, and hickory. Fruits indigenous to the area, such as black raspberries, papaws, elderberries and wild strawberries, are also collected as a food source. Salads may be spiced up during growing seasons for dandelions, fiddlehead ferns, ramps, and cattails. 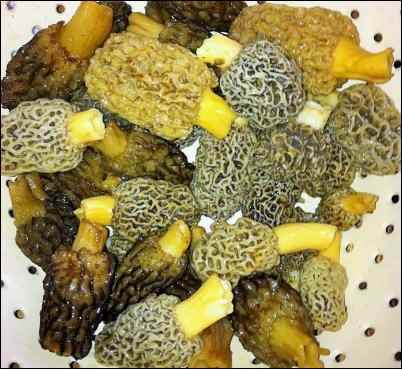 Our favorite time of year for foraging is spring when we are able to search for morels. This delicacy is native to the area and provides fun hunting opportunities as well as a tasty treat! Their growth is aided by indigenous trees such as the elm and poplar. The swampy terrain lends to their growth with all the decaying bark and moist ground. The forest region where we live supports an abundant supply of wild game. The primary food source for us is deer. We are lucky to live in a “big buck state” where not only do we have a large supply of deer but they grow to record-book size. We are meat hunters by nature, but my backwoodsman and the boys all get excited for the big bucks each year. Venison is our largest supply of meat through the year as we are typically able to stock the deep freezer. The entire extended family deer hunts and leaves at least part of their harvest with us after hunting each season. The next primary food source we rely on from local game is wild boar. This is a newer wild animal and is not indigenous to the area. They have been breeding at an alarming rate so it is becoming more common to see them in the woods. My backwoodsman is the primary hunter for wild boar in our family. He hunts with dogs and travels to where they have are reported sighting of them in larger numbers. They travel large distances and the population is not to the point where you can easily find them. The size of the boar in Ohio ranges from babies to 400-500lb. boar. The larger ones are tricky to cook, the meat is tough and difficult to work with. Crock pot recipes are the best way to enjoy the harvest of these larger boar. There is a number of other animals we have the opportunity to hunt, but not as frequently, in our area. This includes turkey, a challenging hunt but not a meat we prefer. My husband loves the challenge of the sport so anything harvested is put to use on the homestead. There is also ample opportunity for squirrel, dove, rabbit, waterfowl, pheasant, and grouse. We also spend time hunting coyotes as they are over-taking the grounds and need thinned out. They do not provide a food source, but their numbers are reflected in the changes of population for game we do hunt. One of our favorite recreational sports is fishing. We find it relaxing and enjoy eating fish when we can. Mercury concerns prevent me from consuming it often and we don’t often get the time to do enough fishing for ample freezer stock. We rely on family as well to provide this tasty treat. My older backwoods-boy has become a fishing fanatic, providing better opportunity for us to acquire fish for the freezer. We usually are afforded the eating pleasure of bass, crappie and catfish. There is much more in the way of wildlife that the backwoods supports. These are just the primary ways which we utilize it for our personal consumption. We feel lucky to live in a region that is so abundant in what it provides for us, allowing an independent and self-sufficient lifestyle which we prefer. The natural resources in our area are also supportive of our livelihood. I am fortunate to have a knack for writing. 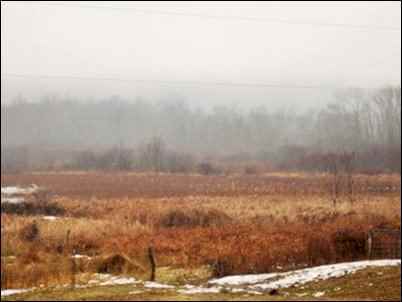 The lifestyle we live and how we choose to maintain it in the backwoods of Ohio is intriguing to many. 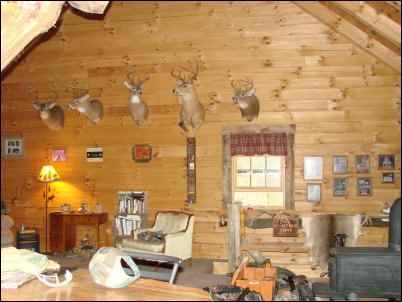 This affords me the ability to write and blog about what I love most, homesteading in the backwoods. I am able to choose from many topics including homesteading, hunting, fishing, foraging, DIY gifts, and much more. I am thankful each day that I am able to work from home and enjoy the outdoors all while generating an income to help support our homestead. My backwoodsman is a fence contractor. The resources in our area help to support his livelihood as well. Lumber mills in the region supply necessary resources for his work to be completed. He designs and installs many different style of fencing, sheds, and small cabins. The work he prefers most are projects derived from wood. His true passion is working with rough cut lumber, creating a rustic style that appeals to us. His skills will be further utilized in building not only our new home, but working on his daughter’s newly acquired home in the area. She also hopes to develop her own homestead and create a niche of her own with midwifery as the foundation. His son I spoke of earlier plans to build a cabin near us, utilizing his father’s expertise as well, harvesting from the backwoods on his land as well. His youngest boy is currently unsettled due to work at this point, but is capable of building his own home soon and is considering a cabin in the country among his options. There are other trades in the area that rely on what the backwoods provides for natural resources. Many in the area are employed in the fields of park services, logging, lumber mills, tourism, and cabin building. The region is popular and attracts a great deal of tourists for camping, hiking, canoeing, nature tours, and bird watching among many other activities. These are some of the many trades which work as an example to the abundance offered by the backwoods. This is a simple, frugal, subsistent, and amazingly beautiful life we live in the backwoods. We appreciate all that we have been given through nature and a minimalist way of living. Things are much less complicated as we have done away with materialistic wants and learned to live with the basics. It’s interesting to find that the less you have the more you want to do without. Projects are always under-way on the homestead. There is always something in need of repair, improvement, or change as we migrate to an off-grid life here on the homestead. Priorities with hunting, fishing, and foraging take precedence as we prefer our food to be obtained this way. Dirt, mud, and messes are commonplace inside and out and the idea of “clean” takes on a new meaning out here. There is no “keeping up with the Joneses”, and I imagine the Joneses would feel a bit out of place in our neck of the woods. Trinkets, showpieces, and most other items that don’t serve a purpose are not commonplace here. The famous quote from the great depression “Use it up, wear it out, make it do, or do without” is a comfort to our way of living. The Backwoods Homestead has been evolving since we broke ground on our cabin nine years ago. We aren’t experts in homesteading and learn new ways to make it work out here every day. The homestead is a work in progress and my goal is to simply have more abundance from our labor each year than we had the year before. We rely on neighbors with more experience to guide us and enjoy learning from our elderly neighbors as they have skills and techniques we still have yet to master. Most are relying on others to have more, strive to gain more worldly possessions or use each other as stepping stones on the corporate ladder to success. The goal here is to rely on others and seek guidance to continue our transition to a simpler, frugal and minimalist way of life. We often have people question why we choose to live this way. “Don’t you want this, need that, or wish you were doing this?” There are many who insist they would never be able to give up their excess, sacrifice possessions, or downsize their lives. These are some of the same people who drop by to visit and visibly change while they are here. I find it rewarding to watch them transform, they visibly relax and a warmth comes over them you can feel. Comments we hear often include, “It’s so peaceful here”, “We felt more welcome here than other homes we visited over the holidays”, and, “I see why you love it here now”. Our life may be a welcome getaway for others, a retreat for some stress-relief in some of our friend’s chaotic lives, for us it is simply home.